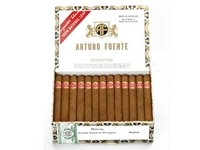 Arturo Fuente - one of those names that you always hear good things about, whether it be from personal experience or from hearing others talk about them. Realizing that a bit of their tobacco has been written off as 'scraps' or 'left overs', the Fuente family decided to use these clippings and create a short filler cigar of the same high quality Dominican tobaccos as the rest of their profile. Providing a consistent, rich and balanced wood and spice combination, the natural tobacco flavors shine through for a long finish. Budget friendly priced, these cigars follow the same quality control procedures that their other cigars do, all at a fraction of the price. Be sure to pick up your box today!